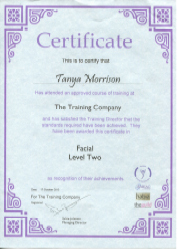 My name is Tanya, and I am a fully qualified beauty therapist based in Crawley, West Sussex – a map of my location can be seen here. I also work throughout the wider West Sussex area. 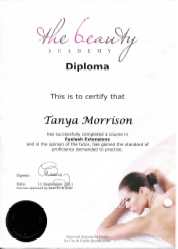 I offer a full range of beauty treatments either from my beauty salon in Crawley, or in some cases as a mobile service. My treatments include: Eyelash Extensions, Sienna X Spray Tanning, IPL Laser Hair Removal, Waxing, Eyebrow and Eyelash Tinting, and Eyebrow Reshaping. I am a fully trained and qualified technician in all the above services. For spray tanning I choose to use either Sienna X spray tanning products, or genuine Fake Bake spray tanning products. In my opinion, these are the best of all the spray tanning products available, giving you a fantastic, flawless finish for more natural looking results. For waxing I only use a premium soft wax called Babyliss Satin Smooth, which is blended with Lavendar and Calendula to make it suitable for use on all skin types. For those clients who require eyelash extensions, I only use premium products, providing a range of lengths to give you perfect lashes. 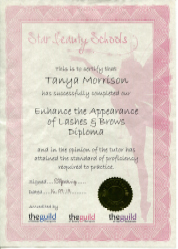 I am now fully qualified and able to provide luxury facials, using Kaeso products as well as Elemis luxury products. For full details of my 45-minute facials, please click here. Whether you require a treatment for a special occasion, a big night out, or just to give yourself that confident edge, I can help. You’ll be dealt with politely and professionally, and my aim is to win you as a regular client by giving you the best service available. I’ve made my prices as affordable as possible, without reducing the quality of products used, or the standard of service offered. I combine this with a friendly, professional and reliable service, with the vast majority of my clients returning to me time after time. For more information about me or to book an appointment, please call me on 07715 372448, or send me your details using my contact form. “I’d been desperately trying to find someone who does good waxing at fair prices near Crawley Down and after several attempts with different beauticians I found Tanned & Beautiful online. I was nervous about meeting another new beautician but Tanya made me feel at home with her welcoming smile and conversation. Not only is Tanya a lovely woman, but I was extremely impressed with the waxing – finally I had found the beautician I was looking for!